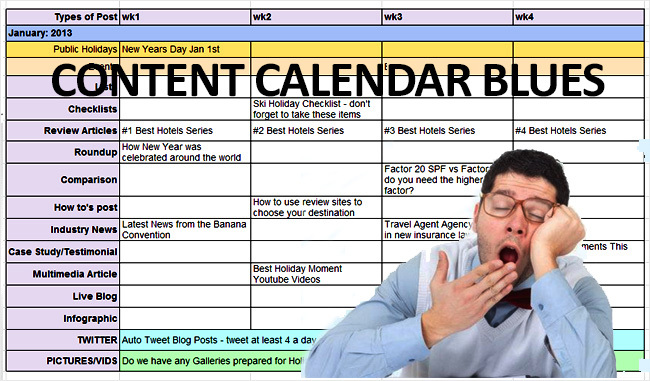 Home » content marketing » social media » Social Media: Is your editorial calendar holding you back from inspired content? 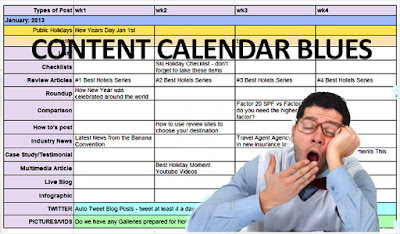 Social Media: Is your editorial calendar holding you back from inspired content? One of the most awkward moments I have experienced at some of our agencies is when I pass by a social media strategist or community manager staring disdainfully at a near blank calendar screen desperately praying that somehow, someone will inspire them to fill in those blanks. A social media editorial or content calendar is often a way to demotivate and deter from inspired content because it is a bunch of blanks on a spreadsheet or a calendar rather than a bunch of great ideas. Yesterday, I wrote a post on 6 ways to get content marketing right. Yes, I did say you need to plan ahead, you need to have done your homework, your research, but I did not say that you really need to have cool content planned for National Dairy Farmers Day. Unless of course, you are the dairy that supplies Ben and Jerry's. I am not saying you should dump your content calendar. It is useful as a tool to plan ahead for what you are going to publish that would meet your overall brand goals, gathering inputs from departments, project managing and having a disciplined approach. But when it boxes you in and stamps out room for inspiration, leaves little room for the here and now, being opportunistic and igniting sparks of creativity, it does more harm than good. A brand's true content goal is engagement, but if the content is derived from filling in boxes on a spreadsheet, there's little value in that. Where's the right time, right audience factor in a spreadsheet filled in months in advance? Good content starts with good ideas and great insight. Today, insight is a must have, and we have no excuses, because there's so much data out there, that if we fail to utilize the power of information, we are not going to be able to engage consumers and deliver on what they want. A calendar delivers (usually) on what the brand manager may want, or what the marketing manager's agenda is. That? Ditch that. Insight leads to inspiration. What does your audience really want from you? What's going to resonate with them? What's hot with them now, today? And you know that two months ahead of time? Sure, you can plan ahead for New Years and Ramadan, but how are you going to react when the new iPhone launches and no one gives a hoot? Where's the room for newsrooming then? Imagine going on a date and planning your conversation a month in advance. Sure, you need to say all the right things, but you can't get them at hello if that hello is hollow. Compelling content adds value. It is on trend. It is contextually relevant, not just to the channel and the medium, but more importantly to what is the surrounding context at that time. And, a editorial calendar stunts that a bit. Imagine if your online newsfeed was planned way ahead by someone filling in "June" in"March" on a Google calendar. Isn't your social, in many ways like a news feed? Let consumers, customers, the competition inspire you every day. Track what they're doing now, research live what they're talking about, and deliver content that grows and glows around that. Be in the moment, not on an Excel sheet. Don't let blank boxes kill inspiration. Loved the tone. Don't necessarily agree with everything said here.